WASHINGTON — The Chinese government is cracking down on Muslim Uighurs, who were blamed for a deadly attack at a train station last week in Kunming, China. Reuters reported that several attackers used knives to kill 29 people and the Chinese government blamed the Muslim Uighurs in the western Xinjiang region. China has struggled with the Uighurs, who are resistant to the Han Chinese (or ethnic Chinese). Uighurs are Muslims and are often at odds with the communist government of China, especially how the government cracks down on their culture and traditions. China has labeled the Muslim separatists as “terrorists” and Islamists. 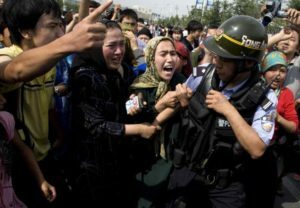 Chinese policemen swept the city’s Muslim Uighur community for the attackers, which jarred the Chinese government because it was the first such attack by separatists outside the Xinjiang region.